CANTON, Mass. (March 4, 2013) –It’s an Irish spring at Dunkin’ Donuts in March, with several sweet new ways to keep running throughout St. Patrick’s Day season. Dunkin’ Donuts, America's all-day, everyday stop for coffee and baked goods, is celebrating the holiday with the new Irish Creme Donut, available at participating Dunkin’ Donuts restaurants nationwide for a limited time. 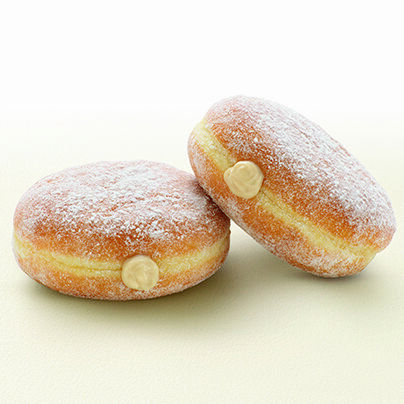 The Irish Creme Donut features a sugared raised shell with Irish Creme-flavored filling and is finished with a sprinkle of powdered sugar. Coffee lovers are also in luck leading up to St. Patrick’s Day, as Dunkin’ Donuts has introduced a full lineup of seasonal coffee beverages, available at participating Dunkin’ Donuts restaurants in select cities throughout the country. The new Irish Creme Coffee features Dunkin’ Donuts’ coffee with a smooth, velvety Irish Creme flavor, available in both hot and iced. Dunkin’ Donuts also has the Irish Creme Latte, available hot or iced, featuring espresso derived from high-quality, 100% Fair Trade Certified coffee beans, and steamed milk, topped with caramel drizzle. Finally, for the taste of Irish Creme in an icy cold beverage, guests can savor the Irish Creme Frozen Coffee Coolatta®. All of Dunkin’ Donuts’ Irish Creme coffee beverages are available at participating Dunkin’ Donuts restaurants in select markets. In addition, guests looking to share the green with friends and loved ones this St. Patrick’s Day can purchase new St. Patrick’s Day virtual Dunkin’ Donuts Cards, available in several fun designs. Dunkin’ Donuts Mobile Cards can be sent via email, text or Facebook through the mGift feature on the Dunkin’ Donuts mobile app, available for both iPhone and Android smartphones. With the mGift feature, users can send a variety of virtual Dunkin' Donuts Cards, which can be redeemed directly from a mobile phone at more than 6,000 participating U.S. Dunkin' Donuts locations. All Dunkin' Donuts mGifts can also be added directly to the Dunkin' App, reloaded right from the phone, and used as a fast, convenient way to pay. Finally, throughout the month of March, Dunkin’ Donuts is offering guests exciting Mobile Offers via the “My Offers” tab on the Dunkin’ App. Guests using the Dunkin’ App can receive $1 off a 50-count box of Munchkin® donut hole treats, or can purchase two muffins for $2. Redeeming a Dunkin’ Donuts mobile offer is as easy as selecting an offer in the “My Offers” section of the Dunkin’ App, tapping to redeem it and then showing the offer’s QR code to a Dunkin’ Donuts crew member to be scanned. The Dunkin’ Donuts Mobile App is available for free from the App Store on iPhone at www.itunes.com/appstore and from the Google Play Store at https://play.google.com/store.